Aryn Clark needed a heart-lung transplant, but the wait was almost sure to be a long one. Advanced technology that did the work of her heart and lungs during that wait kept her healthy enough to be ready once transplant organs became available. Aryn Clark was born with two holes in her heart, a condition known as ventricular septal defect. A pediatric cardiologist in Milwaukee told Aryn's mother the holes would close on their own over time. Throughout her childhood, Aryn didn't have any heart problems. She was even a cheerleader in middle school. But around her 18th birthday, in the summer of 2011, Aryn started to get sick — so sick that she had to abandon her plans to go to college to study graphic design. "I could barely breathe," Aryn says. "I felt like I was going to pass out all the time." Those symptoms were the beginning of a prolonged medical saga for Aryn that led her to Mayo Clinic and an extended hospital stay. 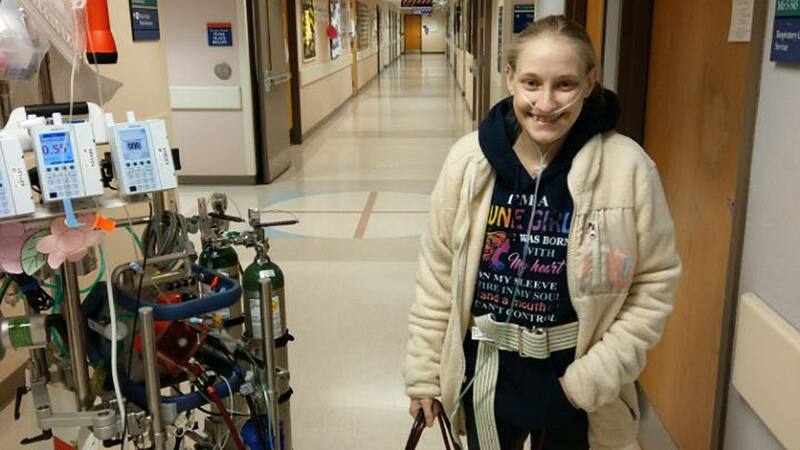 There, advanced therapy called extracorporeal membrane oxygenation (ECMO) helped keep her alive for nine months while she waited for a combined heart-lung transplant. John Bohman, M.D., medical director of the ECMO program at Mayo Clinic's Rochester campus, led Aryn's care during her hospital stay. He credits Mayo's model of teamwork for seeing her through to a successful transplant. "A prolonged and ambulatory ECMO run without complications used to be unfathomable," Dr. Bohman says. "To be able to safely guide Aryn through this long journey required an enormous effort from our entire team, including ECMO specialists, perfusionists, nurses, pharmacists, surgeons, critical care providers, anesthesiologists, physical therapists, lab techs and operating room staff." When Aryn started experiencing symptoms in 2011, she went to see a cardiologist in Milwaukee, 30 minutes from her home in Menomonee Falls, Wisconsin. An echocardiogram revealed one of the holes in her heart was still open, and it had grown to the size of a quarter. The doctor said it was causing pulmonary hypertension — high blood pressure in the lung arteries due to increased blood flow from the heart, which can permanently damage the lungs. Over the next two years Aryn took several medications to treat the pulmonary hypertension. "I would go in for echocardiograms every three months and was told I couldn't have surgery to close up the hole," Aryn says. "The pressure in my lungs was so high. I wouldn't survive the operation." Over time, Aryn's condition deteriorated to the point that her cardiologist recommended she consider a transplant and referred her to Mayo Clinic. In January 2017, Aryn spent two weeks at Mayo Clinic's Rochester campus undergoing an evaluation for a heart transplant and a lung transplant. She was placed on the transplant waiting list soon after for two lungs and a heart. "The transplant process itself was high-risk and defied the odds for Aryn. There are only about 12 combined heart-lung transplants annually in the U.S.," Dr. Bohman says. "Plus, Aryn has an unfavorable blood type and a very small frame, which both significantly decrease the number of potential donor organs that could match her." Just a few weeks later, during a follow-up echocardiogram back home, her local cardiologist called Mayo Clinic. Aryn needed to be hospitalized due to progressive heart failure and hypoxemia — a below-normal level of oxygen in the blood. She was admitted to Mayo Clinic Hospital — Rochester, Saint Marys Campus, where she was placed on extracorporeal membrane oxygenation to help her survive the wait until the organs she needed became available. Extracorporeal membrane oxygenation ensures that the body retains a sufficient supply of oxygen when it can't do so on its own. The device takes over the work of the lungs or the lungs and heart. It involves continuously pumping blood from the body into a machine that removes carbon dioxide and adds oxygen to it. Then the newly oxygenated blood is returned to the body. Aryn stayed in an intensive care unit on extracorporeal membrane oxygenation for nine months. While many people on the machine have to be sedated, Aryn was able to walk around and communicate with her care team. "It was important that she stay active and kept her spirits up, so she could make it to transplant. If she became too debilitated, she would not be a good candidate for transplant," Dr. Bohman says. "She would go on mile-long walks, and we'd have folks that came in on their time off to help make sure she was out and active." "It was important that she stay active and kept her spirits up, so she could make it to transplant. If she became too debilitated, she would not be a good candidate for transplant." — John Bohman, M.D. Although Aryn missed her parents and friends, she developed a close bond with her care team. She also appreciated the extra effort her team made to help her cope with her extended hospital stay. "They treated me like family. We watched movies together. We ate together," Aryn says. "We played board games and card games." Aryn also became close to some of the families whose babies were on extracorporeal membrane oxygenation in the neonatal intensive care unit. "I knew how those babies were feeling," Aryn says. "I would try and comfort the moms and share my experience with them." A few days before Halloween 2017, Aryn was sitting in her hospital room with her dad when the phone rang. She gave her dad the phone, and both of them started crying when they found out there were donor organs available for Aryn. "I was nervous. I was anxious. I was excited. I was even a little sad because I was also thinking about the donor that died to give me these organs," Aryn says. "Everything was rushing in my head. I couldn't believe it." "I was at an ECMO conference in Jacksonville, Florida, when I got a text that there were organs available for Aryn," Dr. Bohman says. "I remember reading that text and having this sort of glowing electricity bolt through my body and, within seconds, tears in my eyes, knowing that we were hopefully going to get her through this journey and out the other side — back to the life she was hoping to live." Aryn received her new lungs and heart during an 11-hour surgery on Oct. 28, 2017. Richard Daly, M.D., a Mayo Clinic cardiovascular surgeon, performed the transplant. The procedure went well. After a month of bed rest, Aryn got to take her first unassisted breaths right after Thanksgiving. "When they took the breathing tube out and brought down the flow of oxygen, and I was breathing on my own, it felt amazing," Aryn says. "Before the surgery, I felt like I was dying each and every day. I was so weak and tired. There are no words to describe this gift I've been given." "Her story really demonstrates the incredible dedication and compassion of our entire staff and how Mayo pushes the limits of what is possible in medicine," Dr. Bohman says. Aryn was discharged on Jan. 2, 2018, and participated in cardio-pulmonary rehabilitation for three weeks while staying at the Gift of Life Transplant House in Rochester. Aryn is still working through some side effects from her surgery. She has foot drop, a condition that involves difficulty lifting the front part of the foot. But she's back at home in Wisconsin doing resistance training and looking forward to getting on the treadmill her parents bought her. "I'm grateful I'm alive and able to tell my story," Aryn says. Aryn's experience with extracorporeal membrane oxygenation has inspired her to become a perfusionist — the health care professional responsible for the setup and operation of the extracorporeal membrane oxygenation machine. She also wants to go to college and volunteer in some capacity to offer support to families who have babies on extracorporeal membrane oxygenation. "A lot of the babies I saw while I was in the hospital, I'm friends with their families on Facebook. When I heard one of the babies got a transplant, I cried," Aryn says. "I want to do something to help them through all this." Learn more about heart transplants and lung transplants. Read about the Mayo Clinic Transplant Center. Connect with others talking about lung transplant on Mayo Clinic Connect. Wow Aryn. That was amazing. Way to go!!! praying there is NO complications whatsoever. Wow Aryn what a trooper you are. I too had pulmonary Hypertension, because of a hole in my heart !! I had my double lung transplant… ready .. October 28th 2012 , they also repaired my heart. Since we are transplant buddy’s 5yrs apart I think that’s pretty cool . I’m doing fantastic!! . You are such a brave girl Aryn.Reading your story gave me hope that my brother will also heal and be able to live normally.My brother is already 33 years old and he is diagnosed with ventriculal septal defect when he was 16.The doctor advised to do a surgery putting a stent in the hole but unfortunately the procedure is so costly and we can't afford it.He was given maintenance medications but all through out his life he is in and out of hospital.Just recently he was discharged from the hospital and the doctor said the pressure in his lungs is so high that he is now experiencing heart failure and pulmonary hypertension.I really cant stand seeing him suffering.He have cough out with blood,visible large veins all over the body,clubbing of fingers,dark bluish nail beds,he gets tired easily.His cardiologist told me that our family should prepare ourselves for the worse and this time the surgery might not be possible anymore.I cried all night and praying for a miracle.He is only 33,and with a 2 year old kid which he love more than anything.He use to ask me if he can still able to see his child grow or is it the time for him to go.My heart is in pain hearing those words from him and I just hug him and cried.I want my brother to be ok and live normally and able to be there for his child until he grew up.I hope that there is still a chance for him to live longer and not to suffer anymore.